From left: Mr Stephen McDonogh, film producer; Mr Gilbert Lim, EVP of Sahamongkolfilm International; Mrs Thippaporn Ahriyavraromp, Group CEO of DTGO; Dr Jwanwat Ahriyavraromp, Founder & CEO of Shellhut Entertainment; Mr Martin Hart-Hansen, Deputy Resident Representative of UNDP Thailand; Mr Jatuporn Buruspat, General Director of Department of Marine and Coastal Resources; Mr Richard Dale, director of ‘Earth: One Amazing Day’. Thai celebrity Piyawat Kempetch interviewed Mrs Thippaporn and Dr Jwanwat Ahriyavraromp before the screening of ‘Earth: One Amazing Day’. 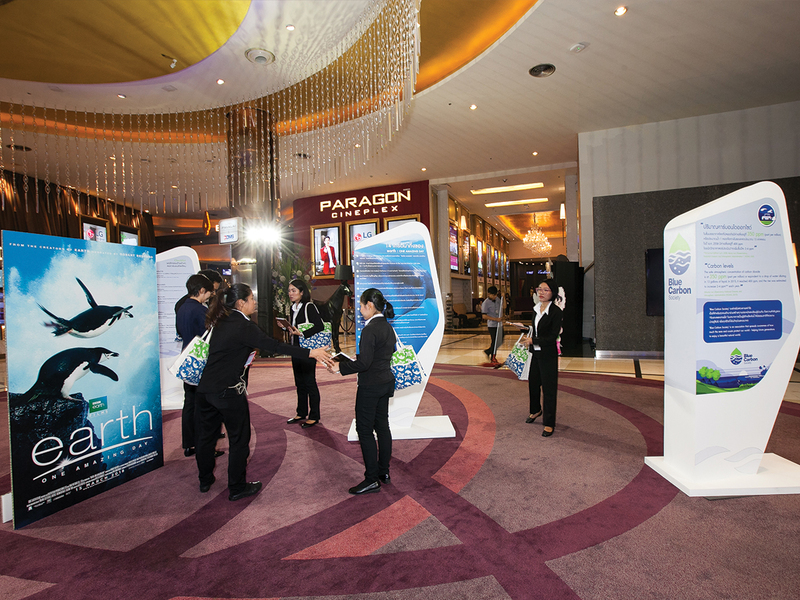 Filmgoers enjoyed a display about blue carbon and ‘Earth: One Amazing Day’ in the foyer of Siam Pavalai Grand Theatre in Bangkok. 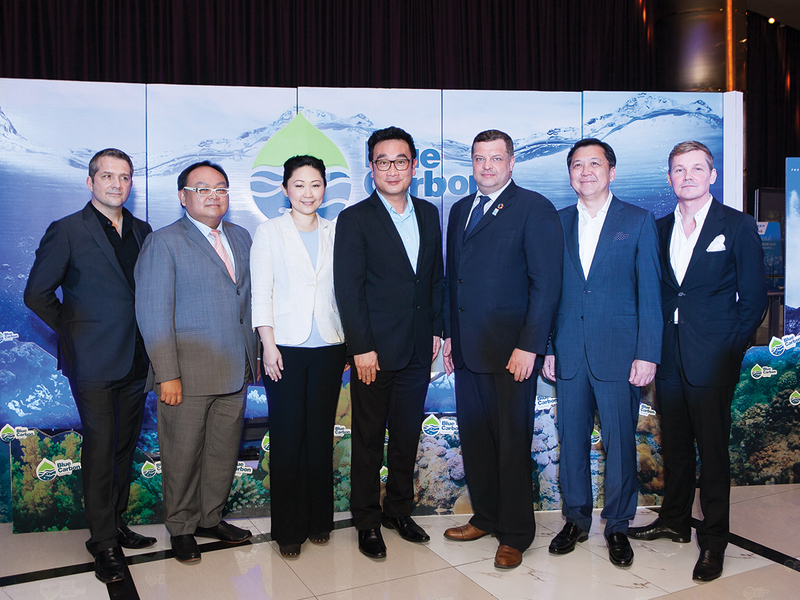 Blue Carbon Society (BCS) debuted on 12 March with a preview screening of the BBC documentary ‘Earth: One Amazing Day’ at Siam Pavalai Grand Theatre in Bangkok’s Siam Paragon mall. At a forum before the film started, Mr Martin Hart-Hansen, Deputy Resident Representative of UNDP Thailand, welcomed the association and the opportunity to work with it to counter climate change and protect wildlife. BCS’s founders – Mrs Thippaporn and Dr Jwanwat Ahriyavraromp – also presented the association’s goals. “Blue Carbon is like a lifeline to safeguard us all from climate change and global warming through the capacities of marine and coastal ecosystems to absorb carbon dioxide from the atmosphere,” said Dr Jwanwat. Blue carbon has attracted greater attention as green carbon resources – such as land forests – are damaged through deforestation, he added. 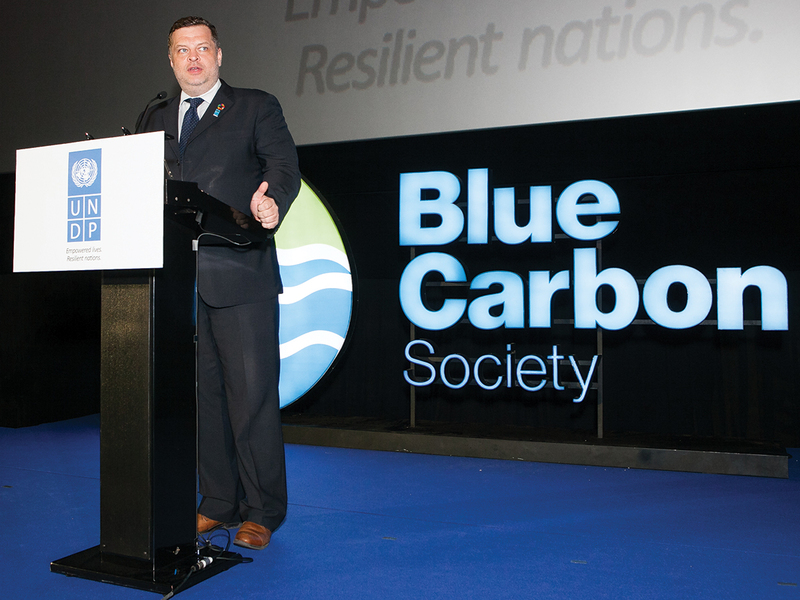 “With the increasing interest in blue carbon by research communities, it was found that blue carbon has more capacity to fix carbon than green carbon,” he said. Dr Jwanwat has long been engaged in marine conservation in Thailand. He is also known as the maker of Shelldon, an animated series about marine life that has been broadcast in over 180 countries. Mrs Thippaporn established DT Group of Companies as a community of smart and good-hearted people who care for society. She sees Blue Carbon Society as another positive community, looking after natural resources and ecosystems – including endangered marine species like the dugong. UNDP’s Mr Hart-Hansen welcomed Blue Carbon Society as “a great example of how the private section can be directly involved with biodiversity conservation”. The documentary’s BAFTA and Emmy award-winning director, Richard Dale, and its producer, Stephen McDonogh, traveled from the UK for the event and also spoke at the forum.